UK Stampin' Up! 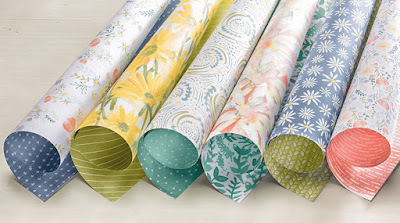 Demonstrator | make beautiful cards | Crafty Hippy: Simple Daisy Card - Delightful Daisy Designer Series Paper from Stampin' Up! Simple Daisy Card - Delightful Daisy Designer Series Paper from Stampin' Up! This card was really quick to make. Once I had my card front cut from Whisper White Cardstock, all I had to do was run it through the Big Shot twice - once with a circular die from the Stitched Shape Framelits Dies and then again in the Softly Falling Textured Impressions Embossing Folder. The gorgeous paper in the background is our Delightful Daisy Designer Series Paper - this pack of paper has so many designs and gorgeous colours and the centre of the daisies can be embellished with our Clear and Gold Faceted Gems. I chose to keep the daisies plain on this card and just use the paper. 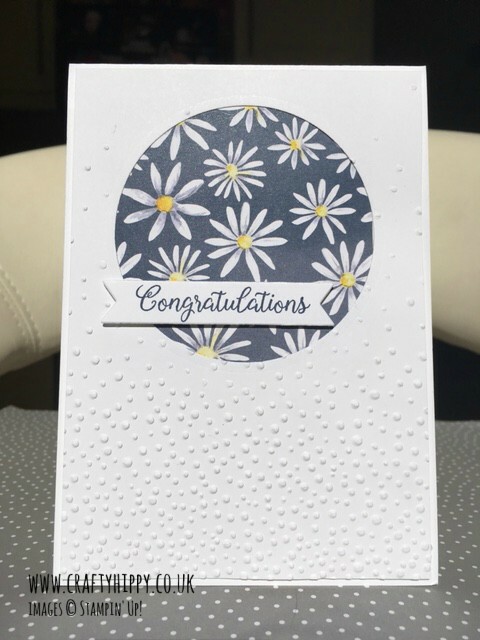 I used the Congratulations sentiment from the Beautiful Bouquet stamp set - this stamp set is gorgeous and has several really useful sentiments. The sentiment was cut out using the Bunch of Banners Framelits Dies in the Big Shot. Obviously you could swap the daisy paper for any of the papers in the Delightful Daisy DSP, or indeed any other designer paper that you have.